Amongst the various dimensions of state power are state autonomy and state capacity. It is important to remember that they are distinct concepts and there is no obvious relationship beween the two. As the chart below (taken from Chapter 3 of O’Neil) demonstrates, a state can have high capacity and low autonomy (or vice versa) or high (or low) levels of both. Can you think of a country that would fit in each cell of the 2X2 matrix below? State is able to fulfill basic tasks, with a minimum of public intervention; power highly centralized; strong state. Danger: Too high a level of capacity and autonomy may prevent or undermine democracy. State is able to fulfill basic tasks but public plays a direct role in determining policy and is able to limit state power and scope of activity.Danger: State may be unable to develop new policies or respond to new challenges owing to the power of organized opposition. State is able to function with a minimum of public interference of direct control, but its capacity to fulfill basic tasks is limited. Danger: State is ineffectual, limiting development and slow development may provoke public unrest. State lacks the ability to fulfill basic tasks and is subject to direct public control and interference—power highly decentralized among state and nonstate actors; weak stateDanger: too low a level of capacity and autonomy may lead to internal state failure. Here’s a fascinating debate from the 1960s between two American intellectual giants–William Buckely and Noam Chomsky–on the morality of military intervention. Chomsky makes a very strong claim: in the history of humankind never has a state intervened military on the basis of disinterested (i.e., altruistic) motives. Military intervention is always about the furthering of self-interest, but is often dressed up in garb of humanitarianism. Chomsky notes, of course, the few exceptions; exceptions, that is, in the sense that some states didn’t even bother trying to put a veneer of humanitarianism on their naked power grabs–think Belgian in the Congo. Do you agree or disagree with the following statement: Humanitarian interventions of the 19th century were less humanitarian than imperialistic. Great powers simply cloaked what amounted to self-interested military intervention in the garb of humanitarianism, when these interventions were nothing of the sort. Explain. Is the realist worldview tenable, given what you know about some of the humanitarian interventionS of the 19th century? What was the effect of media–the so-called CNN effect–on the humanitarian impulses during the 19th century? Here are some data resources that may be helpful to you while researching and writing your first paper assignment. I’ll be showing you how to use/access some of these sources in class on Thursday, September 23rd. Steven Fish and Matthew Kroenig. 2009. The Handbook of National Legislators. A Global Survey. Cambridge University Press. [On reserve at Bennett Library] JF 511 F57 2009. 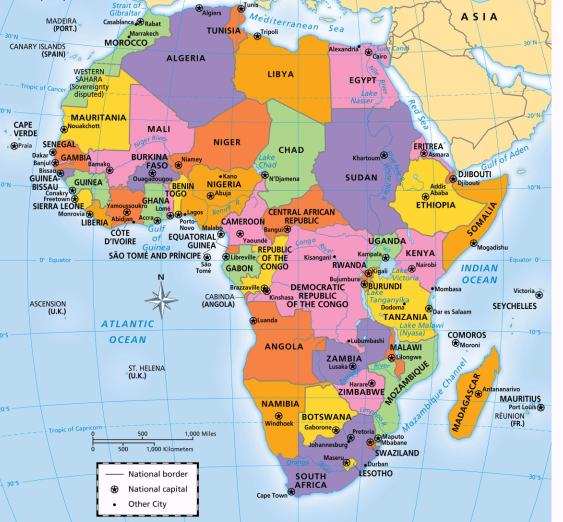 Does Africa Need a New Map? Borders created through some combination of ignorance and malice are today one of the continent’s major barriers to building strong, competent states. No initiative would do more for happiness, stability, and economic growth in Africa today than an energetic and enlightened redrawing of these harmful lines. Rethinking the borders could go far to quelling some of these conflicts. Countries could finally be framed around the de facto geography of ethnic groups. The new states could use their local languages rather than favoring another ethnicity’s or colonial power’s tongue. Rebel secessionist movements would all but disappear, and democracy could flourish more easily when based upon policies, rather than simple identity politics. On top of that, new states based on ethnic lines would by default be smaller, more compact, and more manageable for governments on a continent with a history of state weakness. Assuming that the political will to achieve this goal were to evolve, what would be the best mechanism? What would Herbst’s argument be? Is this even feasible? Where would one draw the new boundaries? How would one define an ethnic group? Refer to these two maps to get a sense of the near impossibility of the task at hand. While there are about 50-odd states in Africa, there are literally hundreds of geographically-concentrated ethnic groups. In addition, there is a tremendous amount of inter-mingling of ethnic groups as well. 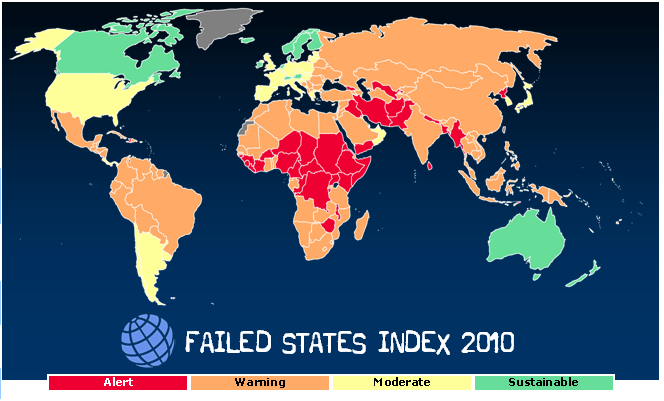 Notice the geographical concentration of failed states (in red). Why are the vast majority of the world’s failed states found in central Africa and southwest Asia?